EDIT: 10/27/18: Fixed the macro with my current in-use copy. After days and weeks of testing the Vengeance Demon Hunter, we have discussed and come up with the following build that should be suited for all needs. Enix and I have theory tested many training dummies and spent hours on Discord trying to read what the best mitigation, DPS, and cooldown usage for this class. We used Details addon to watch how certain things are being cast and how the resources are best managed. If you’re looking for an excellent understanding of how this class works (we) suggest you check this link out YouTube Video Link This is NOT a min/max guide but more a very detailed overview of how Demon Hunters should be played at the launch of Battle for Azeroth. 2. I do use Razer/Logitech software. Both are set to 50ms and I set it to spam that button over and over. Both Enix and I agree that the sweet spot is around 80ms, but we suggest you play with the setting based on your latency from 50-100. 3. I use modifiers please don’t ask me to remove them. If you want them removed just take it out but I strongly suggest you learn to use them to be fast with your class as you’re the tank after all. 4. Not every spell is on the macros. There are many situational things to cast with Demon Hunters but the majority are in there that you need to tank effectively. 5. Talent = 1213323 (Yes, you can change them but we don’t recommend it based on how this build is specifically set up. Rest assured that these talents are the most recommended by Icy Veins, Forums, one of the Method guild members. 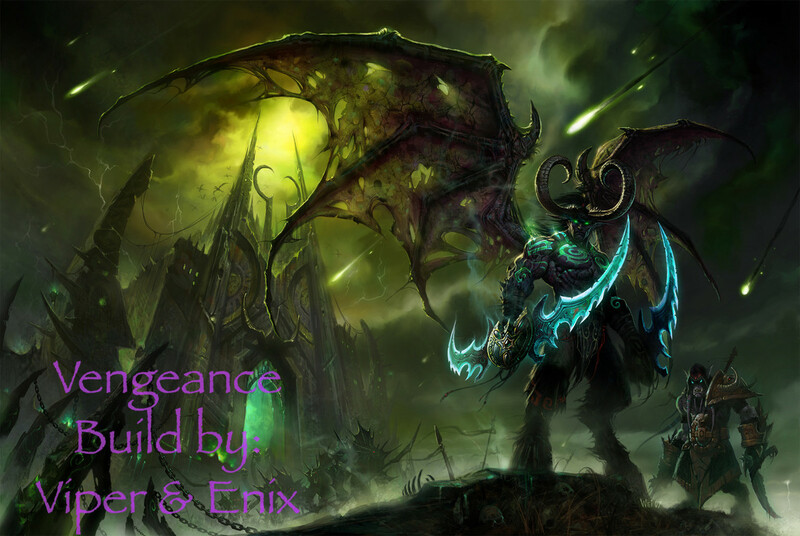 The Vengeance Demon Hunter is a tricky class to GSE. Still with that being said we had to balance defensive cooldowns, mitigation, DPS, and health regen. We did this in order to prevent the rotation from locking up on us or not casting what we wanted. There are SHIFT, CTRL, and ALT modifiers in the build. The macro has to have Infernal Strike, and Metamorphosis cast manually. The main reason we want this is if an add gets away from you or you need to kite the boss you have them available. The last thing about the build is we have Consume Magic as a modifier. If you install the addon TellMeWhen Addon Link then you can import the code below. It will show you “WHEN” you can dispel from the mob with Consume Magic. At that point you would hold the consume magic modifier. It’s something a lot of Demon Hunters miss and is very important not only to dispel but it gains us 20 pain. Well, this is very impressive, more dps, great healing, took me a little bit to get the hang of infernal strike as a mod, but, awesome work guys! Thanks, Ulrik we appreciate the compliment. Yeah, would have loved for it to be in the rotation but honestly, with over 60 mythic tank runs (3 diff tanks) and various Heroic/Reg I felt it was best to be left as a mod because you need it in kite situations. Just started leveling my DH and went with this macro. Simply amazing so far. I had no gear on my 110 Veng DH other than 1 legendary. Using this for Infernal Strike is useful aswell. It uses the abilities well, demon spikes gets used better not back to back. Have run several dungeons now and it works extremely well. The macro was designed with some customization in mind. Demon Spikes, for example, if they are firing off too soon you can increase the Inner Loop Limit, or if we pick up an Azerite ability later that adds a charge, we can take advantage with minimal effort. Awesome, Thank You, changed it a bit as I do not use modifiers, my fingers hurt when I try to get to them so I use numbers instead, seems easier to me.